B.D.R Products is the leading manufacturer and Exporter of a wide range of Sewing Needle. These Sewing Needleare known for their long lasting and perfect finish. 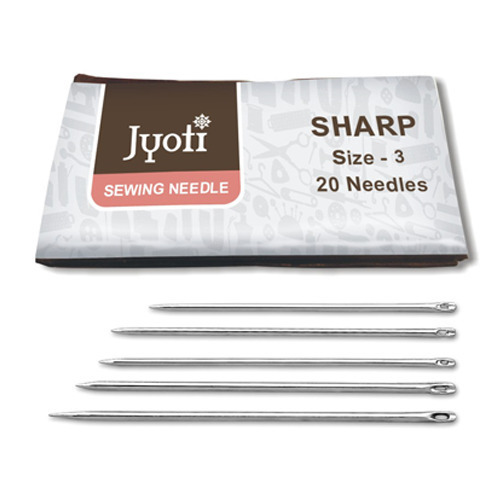 Available at various shapes and sizes these Sewing Needle are highly acclaimed by our clients. What started-off as a small shop in Old Delhi, is an internationally recognized brand today. A venture of that is the brand called Jyoti. Founded by Mr. Raj Kumar Jain in a nook of Old Delhi in 1971, Manufacturing and exporting of knitting pin. Never had he imagined this business venture of his to go global. The humble shop slowly added products to its range and reached time. 20 years into the business and the shop became a brand, with evolving time it got registered as B.D.Raj & Co. During this time Jyoti was also formed, it was selling 'high-quality knitting pins'. Over the years, Jyoti got established amongst other knitters in India. We’ve traversed a long way from where we started with your support. We are proud and honoured to place ourselves into the Indian retail market at par with any existing brand. We come to you with a brand new and improved.